Chelsea, for the first time under Maurizio Sarri, have blinked. Their pristine record was checked across the capital, the visitors running aground on West Ham United�s industry on a day when Eden Hazard�s flicks and darts into space did not quite come off, the monopoly of possession did not translate into drive through midfield, and the crosses lofted into the middle tended to find N�Golo Kant�, at 5ft 6in, rather than the towering Olivier Giroud. It all felt rather forced and awkward, an occasion to leave the Italian grumbling in frustration. Maybe that delayed flight back from Thessaloniki, pushed back 12 hours to land on Friday afternoon, had left them jaded after Europa League exertions. Certainly they lacked the guile to disrupt a resolute West Ham side who were effectively and efficiently organised by Declan Rice, the teenager who had spent seven years at Chelsea�s youth academy and sat in front of a rugged back four with tenacious teammates contributing eagerly at his side. Manuel Pellegrini�s hosts will have taken huge heart from making life so uncomfortable for a team who had started the weekend atop the table. Yet they might have claimed more than a mere point given that they had prised out the better chances, as rare as they were, amid their huff and puff. 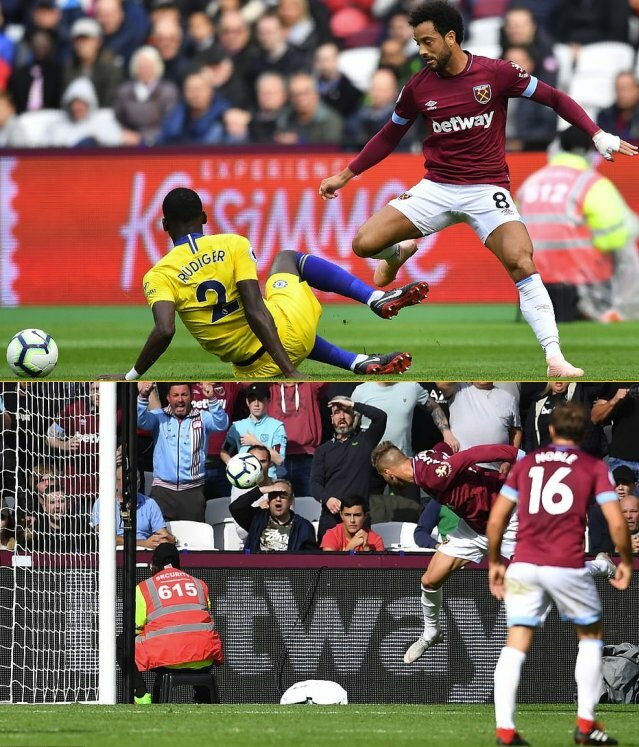 None was more appealing than the one that came 13 minutes from time as the substitute Robert Snodgrass swung over a cross from the left that found Andriy Yarmolenko, free beyond a distracted Marcos Alonso at the back post. The winger, summoning his best Mamadou Sakho impression, somehow headed wide to the disbelief of the majority in the stadium. That the Ukrainian was later awarded the sponsors� man of the match award felt rather curious. In that context, and considering the chances passed up by Michail Antonio in the first half, Chelsea�s point might actually be considered a bonus. Yet the frantic nature of their late push for a winner betrayed the reality that this was a wasted opportunity. Perhaps it all served to justify Sarri�s consistently downbeat assessment of his team�s title chances this term, reiterated in the aftermath of Sunday�s stalemate. It only takes Chelsea, and Hazard, to be slightly off colour to leave them looking flawed as challengers to Liverpool and Manchester City. They are a good team with some exceptional individuals but still a work in progress, a team in need of time to develop. Hazard�s display summed it up. Where he has been offered space in recent weeks to exploit behind a front man, he has thrived. Here he was crowded out on the left flank and, invariably, by Rice when he drifted centrally. Pellegrini admitted his gameplan had been to funnel Chelsea down their right rather than left, where Hazard and Alonso have been their most potent attackers this term. It proved successful until the Belgian swapped wings for the fraught latter stages and finally found some joy � though by then desperation was prompting overelaboration. When offered his clearest sight of goal, he chose to backheel in the hope of finding a teammate. If he is shackled, or simply not at his spritely best � he had missed the midweek game because of fatigue, after all � then the group appear diminished. They control the ball comfortably enough, as illustrated by Jorginho�s club-record pass completion tally in midfield, but the threat came only in fits and starts with Giroud swamped and peripheral. �lvaro Morata, striking Lukasz Fabianski in the face with a close-range flick, and Ross Barkley injected urgency late on. Sarri bemoaned an inability to move the ball quicker. The satisfaction should have been West Ham�s, and they would have celebrated their point more wholeheartedly had they not passed up clearcut chances themselves. How they cursed the absence of the injured Marko Arnautovic and Javier Hern�ndez. Yarmolenko�s miss was the most mind-boggling, but Antonio, standing in at centre-forward, might have scored twice around the half-hour mark. First Felipe Anderson spun away from C�sar Azpilicueta and slipped a pass beyond a backtracking Antonio R�diger � who would later retire hamstrung � which sent Antonio through only for the striker to clip the angle of post and bar with his shot. Moments later Rice exploited Alonso�s desire to push upfield by clipping a pass into the space vacated by the Spaniard, on to which Yarmolenko tore. The Ukrainian drove at David Luiz with the ball eventually running through to Antonio, in the six-yard box, but Kepa blocked his shot from point-blank range.